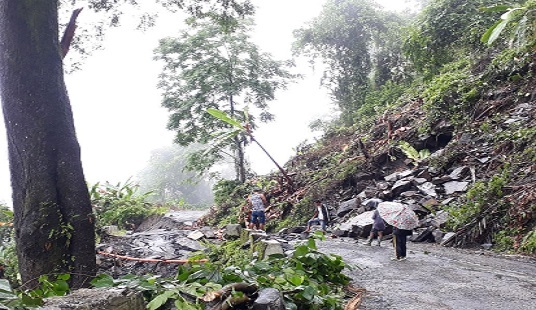 Heavy landslides at three places in West Kameng district of Arunachal Pradesh severed road links at Sessa-Tipi towards Bomdilla on Friday afternoon. Thrizino-Buragaon legislator Kumsi Sidisow told Northeast Now that landslides occurred at three places on that particular road sharing the international border near Tawang. Massive rainfall for the last few days triggered the landslides. Tourists and stranded vehicles were evacuated on Friday evening. Authorities informed that it would take two-three days to re-open the road for traffic. Total power cut also hit the area causing severe inconvenience to locals and tourists. Internet connectivity and telephone services were also disrupted in the district. Deputy Commissioner of West Kameng district Dr Sonal Swaroop Bomdila told Northeast Now on Saturday morning that the movement of traffic in the area had been stopped till Monday.